Showing 1 - 9 of 9 Products for Engine Cylinder Head. WARNING CA Proposition 65 Message: Warning: This Product Can Expose You To Lead; Which Is Known To The State Of California To Cause Cancer Or Birth Defects Or Other Reproductive Harm. For More Information; Visit Www.p65warnings.ca.gov. Direct bolt-on heads for 1961-76 390-427-428 Ford Stock and Super Stock racers. No port profiling or bowl blending of ports. Engraved with the NHRA Logo on both ends. Number 60087 is sized for 2.09in./1.66in. valves for 427 low riser applications. The Edelbrock Total Power Package(R) concept of selling dyno-matched components has been popular since the 1980s, but with the introduction of the Performer RPM Power Package Top End Kits, Edelbrock matched parts are now available under one part number! Our Top End Kits have been a huge hit due to their all-in-one-box convenience and "no guesswork" performance appeal. With just about everything you need to top off your Chevy, Chrysler or Ford, these Top End Kits are performance-proven. 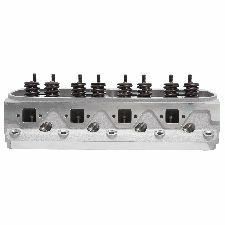 Cylinder Head Specifications: Combustion chamber volume: 60cc; Intake runner volume: 170cc; Exhaust runner volume: 60cc; Intake valve diameter: 1.90" / 2.02"; Exhaust valve diameter: 1.60"; Valve stem diameter: N/A; Valve guides: Manganese bronze; Deck thickness: 5/8"; Valve spring diameter: 1.460"; Valve spring maximum lift: .550"; Rocker stud: 3/8" with guide plate; Guideplate: Hardended steel; Pushrod diameter: 5/16"; Valve angle: N/A; Exhaust port location: Stock; Spark plug fitment: 14mm x 3/4 reach, gasket seat * Use with Hydraulic Flat Tappet camshafts .550" max lift. 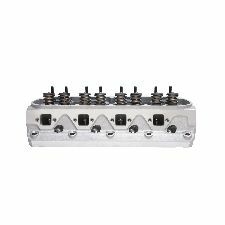 (NOT compatible with Hydraulic Roller Camshafts) Recommended spark plugs are Champion RC12YC or equivalent 14mm x 3/4" reach with flat gasket seat. Requires hardened pushrods. 289-302 c.i.d. with 7/16" head bolts requires #9680 head bolt bushing kit. 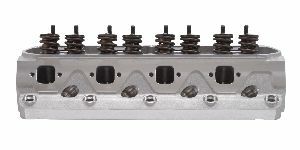 1.90" heads are ideal for stock pistons; 2.02" heads require additional piston to valve clearance. 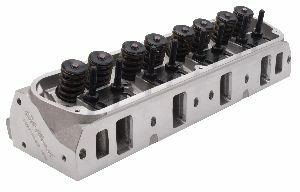 Rocker arm studs & guide plates are not included with bare versions of E-Street cylinder heads. Cylinder Head Specifications: Combustion chamber volume: 60cc; Intake runner volume: 205cc; Exhaust runner volume: 62cc; Intake valve diameter: 2.08"; Exhaust valve diameter: 1.60"; Valve stem diameter: 11/32"; Valve guides: Manganese Bronze; Deck thickness: 5/8"; Valve spring diameter: 1.46"; Valve spring maximum lift: .575"(5028) / .650"(5027); Rocker stud: 3/8"; Guideplate: Hardened steel; Pushrod diameter: 5/16"; Valve angle: 20°; Exhaust port location: Stock; Spark plug fitment: 14mm x 3/4 reach, gasket seat * INSTALLATION NOTE: Hardened pushrods required, use Edelbrock #9632 (flat tappet only) for 302 applications. Will not accept rail rockers. 289-302 V8s require Head Bolt Bushings #9680 and either Head Bolt Kit #8552 (7/16") or stock head bolts. Match with Edelbrock head gasket sets. Bare heads will have valve guides and seats installed, but will require final sizing & a valve job to match the valves you will be using. Recommended spark plugs are Champion RC12YC or equivalent 14mm x 3/4" reach with flat gasket seat. 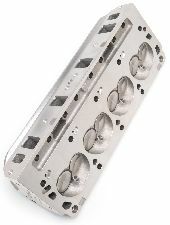 50 state street legal aluminum cylinder head. Out-of-the-box bolt-on performance. Intake valves are used for stock pistons.